GOLD: First resource estimate for Iamgold’s Monster Lake contains 433,300 oz. 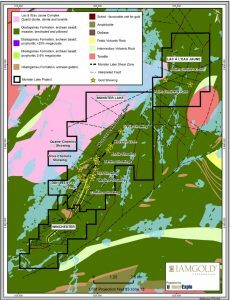 QUEBEC – Toronto-based Iamgold has filed the maiden 43-101 report for its Monster Lake gold property 50 km southwest of Chibougamau. It’s early days for the project, but the company has already outlined 433,300 contained oz. of gold in 1.1 million tonnes grading 12.14 g/t gold. The project is owned 50% owned and operated by Iamgold, who has an option to increase its holding to 75%. The other equity holders are TomaGold Corp. (45%) and Quinto Resources (5%), both headquartered in Montreal. The resource is contained in four discrete zones where geological and grade continuities have been demonstrated. An underground mining scenario is anticipated. Historic drilling by TomaGold outlined a 4-km long structural corridor along which most of the gold occurrences have been discovered. Iamgold considers the Monster Lake property to have the potential for adding more resources along the identified shear structures as exploration goes forward. More information about Monster Lake is posted at www.Iamgold.com.